Overcoming your fear of draw shots. I coach a lot of amateur players that set up at the table and address the ball properly. And on stop shots and follow shots they stroke the ball pretty well, with consistent timing and tempo. Draw shots, however, are a completely different story. In all honesty, maintaining good fundamentals on draw shots can pose problems even for pros. But I�d say 95 percent of the amateurs with whom I work are terribly inconsistent when it comes to draw shots. They always hit the cue ball too hard and don�t follow through properly. It�s all about tempo. If you come back with the cue and stroke through the cue ball at the same speed and keep a nice loose grip, the cue ball will come back with very little effort. I�ve always been amazed by the Filipino players� ability to draw the ball using a soft stroke. They follow through four or five inches and get great reaction from the cue ball. It looks so effortless. Instead, most amateurs get a little anxious on draw shots, and it throws off their tempo. Their stroke changes. They bring their cue back only 75 percent of the way on the backswing. This causes them to come through too quickly and too hard, throwing their timing off. Don�t confuse yourself by thinking you have to hit the ball harder. You don�t. Relax and trust your stroke. Disrupting your tempo also produces inaccuracy. Often times, when you come through too quickly, you lift your head slightly and your shoulder drops a touch. When this happens, you end up striking the cue ball left or right of your intended contact point. These are subtle movements. You might not even know you are doing them, but they affect the shot. It�s a natural breakdown of the stroke. We all do it. When you play long enough, you can immediately tell when this happens. You can feel the tension in your grip or in your shoulder. In fact, the only time you should feel any tension in your hand is after you hit the cue ball. You should be able to feel it only between your thumb and index finger. If you feel tension in the palm of your hand or in your shoulder, you know your stroke broke down somewhere along the way. Another thing I�ve noticed with amateurs is that they don�t always address the cue ball where they intend to contact it. On draw shots, they tend to address it between the middle and the bottom of the cue ball. This forces them to dig down with the tip to hit the proper contact point. Now the cue is elevated and they end up jabbing at the ball. When you get really low on the cue ball with the back of the cue elevated, you often miscue. Most miscues occur when the tip actually hits the cloth before the cue ball. And that happens because your timing and tempo have been thrown off. Finally, hitting the ball harder than necessary makes the pockets tighter. There is a smaller margin for error when the ball is coming into the pocket at a higher rate of speed. If you hit the ball nice and easy with a smooth stroke and it catches a bit of the rail, it will still drop. If you hit it hard and it catches the rail, it is going to jar and stay out. Naturally, solid practice drills will help. The drill I described in the May 2016 issue (�Proper Practice�) is one that I always introduce to amateur players: a middle-distance, straight-in shot, with the object being to pocket the object ball and draw the cue ball straight back to the rail. It is a great way to practice timing and tempo with a draw shot. I start every practice session with this drill. Another great drill is shown in the diagram. This drill focuses on timing and tempo, but also brings in feel, pattern play and staying in line. Place the balls along the headstring and footstring as shown in the diagram. You get cue ball in hand in the center of the table. 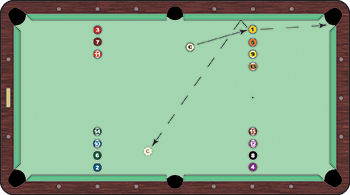 Pocket the balls in rotation, keeping the cue ball in the center of the table. This is a fun drill because you play shots that would come up in a match and you are learning pattern play. You also need to focus on tempo and controlling the cue ball. You may have to power draw one shot and easy stroke another, which is what makes it such a great drill for draw shots, feel and staying in line. And remember, the backswing and follow through should be the same tempo on all shots � stop, follow and draw.